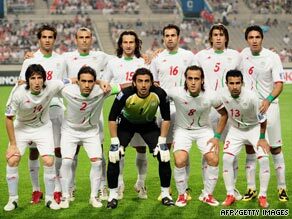 TEHRAN, Iran (CNN) -- Members of Iran's national soccer team wore green arm and wrist bands Wednesday during their World Cup qualifying match against South Korea. Members of Iran's National Soccer Team sport green bands in their game against South Korea on Wednesday. The team does not normally wear green bands. Many Iranians are viewing the team's bands as a sign of support for Iranian opposition leader Mir Hossein Moussavi, although that has not been confirmed. Green is the campaign color of Moussavi and has been widely worn by his supporters who have staged massive rallies in Tehran before and after last week's presidential election. Moussavi is disputing the results of the vote that gave President Mahmoud Ahmadinejad a second term and is calling for a new election. The players took the wrist bands off when the team came out for the second half of the game that was taking place in Seoul, South Korea. It is unclear whether the players were asked to remove the wrist bands.